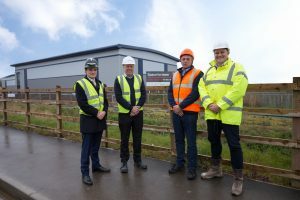 One of the UK’s leading glass suppliers is set to become the first occupier at a new multi-million pound business park in the South West, joint venture developer Richardson Barberry announced today. For more details on More+ Central Park, visit www.morecentralpark.com. CAPTION: (from left) Charlie Swanson, of Cushman & Wakefield, Mark Watkins, of Richardson, Richard Palmer, of Pilkington, and Jonathan Robinson, of Barberry, at the More+ Central Park development at Bristol.